cs papers that I liked. The authors present an extremely tiny implementation of miniKanren in just under 40 lines of scheme. The conciseness and especially the lack of macros make this an excellent starting point for building a miniKanren system in a non-lisp. 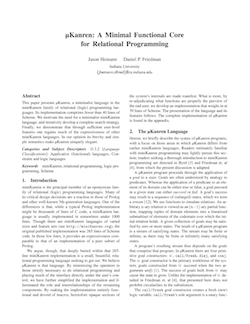 Dan Friedman spent decades building logic programming systems in scheme. Together with Jason Hemann, the essence of those systems was extracted, and distilled into the product that is μKanren. It gets to the core of what it means to build a relational machine, and does so on a level that is actually usable in practice. Logic and computation are very closely linked. 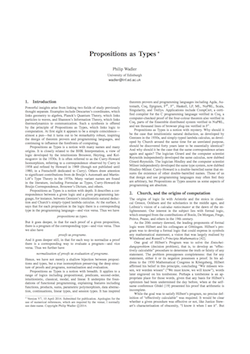 There is a correspondence between logical propositions and types. This means that proofs are programs and the normalisation of proofs is the evaluation of programs. Wadler gives a history of computation: Church and Turing. Logic: Genzen. Intuitionistic logic: Brouwer, Heyting, Kolmogorov. Finally, propositional logic and the simply typed lambda calculus are introduced and the Curry-Howard correspondence manifests itself! This very beautiful and short paper first presents the possibility of quines: self-reproducing programs. It then introduces the idea of evolving a C compiler by adding features to the compiler that, once compiled, can be used in the source language the compiler is written in, playing with the idea of bootstrapping. Finally, these two ideas come together, when the compiler is attacked and a trojan horse is injected into a compiler, which then is able to add itself to any future version of the compiler. It is almost as if the compiler has been learnt something that is not visible from the outside. 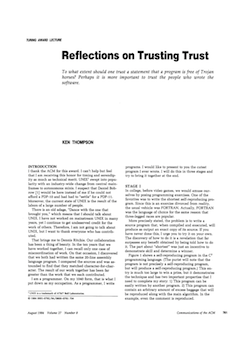 It raises some interesting questions about trusting compilers and CPUs indeed. 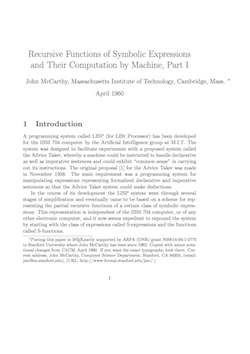 The incredible paper that introduced lisp. It defines functions, conditional expressions and basic data structure elements, then builds the lisp system from the ground up. The highlight is a meta-circular interpreter: A lisp interpreter written in lisp. The last few pages deal with implementation notes and casually describe mark- and-sweep garbage collection.